Unai Emery has called on Arsenal supporters to put behind them the ugly incident of Wednesday night, forgive and support Petr Cech. The goalkeeper returned from injury after missing five games and amidst jubilations that he is back in the team, the former Chelsea man committed a blunder which turned a number of fans against him. The Gunners triumphed 2-1 over Blackpool United to qualify for the quarter-finals of the Carabao Cup where they will lock horns with their North-London rivals Tottenham Hotspur. The story may had however been different had a second goal from the opponents caused by the carelessness of Cech not been rightly ruled offside. This act by the Czech international that almost 'Ceched' his team out of the competition last night has caused massive backlashes from fans but the manager has pleaded with them to leg go their disappointment and give maximum support to the veteran goalkeeper. 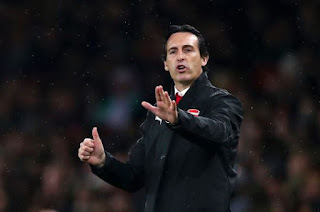 Quizzed on Cech’s error after the win, Emery replied: ‘It’s normal, the centre backs when they are with the ball and have pressure from the opposition, they need to play with the goalkeeper and continue building up our attacking moments. ‘I want to give them confidence, give them calm and it’s true after today with this mistake, the supporters also, as the ball is arriving to him, it is better to continue supporting him and other players confidence to continue our style and our idea on the game. A vast majority of the fans want Cech dropped as first choice to allow the better and more confident Bernd Leno to take his place but it remains to be seen how the Spanish manager responds to their demands by the time Arsenal host Liverpool on Saturday.